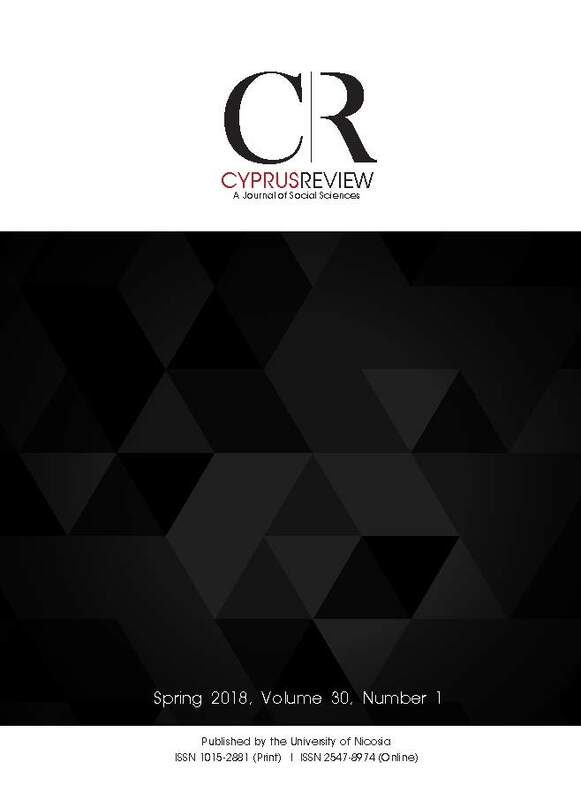 This paper examines the case of the Republic of Cyprus’ (RoC's) quest for exploring natural gas reserves in its Exclusive Economic Zone (EEZ) amidst Turkey’s threats, under the lens of coercion and deterrence theory. In particular, it evaluates the effectiveness of Turkey’s threats in an effort to force the RoC to cancel its exploratory drilling in the Eastern Mediterranean. It hypothesizes that the international oil and gas companies that are exploring the Cypriot EEZ suggests an intervening variable that modifies the power distribution in a game where Turkey attempts to coerce the RoC and thus to impose its will on it as a result of mutual rational power calculations. In the framework of our analysis, we focus on Alexander George's ‘coercive diplomacy’ in evaluating Turkey’s strategy. Andreou, E., (2016, August 2) ‘Turkey warns foreign firms over interest in Block 6,’ Cyprus Mail. Available at http://cyprus-mail.com/2016/08/02/turkey-warns-foreign-firmsinterest-block-6/, accessed 6 October 2018. Art, R. (2003) A Grand Strategy for America. Ithaca: Cornell University Press. Ellsberg, D (1968) ‘The Theory and Practice of Blackmail,’ RAND Papers P-3883, Santa Monica, CA: Rand Corporation. ENI, (2018, February 8) ‘Eni announces a gas discovery Offshore Cyprus,’ Eni.com. Available at https://www.eni.com/en_IT/media/2018/02/eni-announces-a-gas-discovery-offshorecyprus, accessed 3 October 2018. ENI, (2015, August) ‘Eni discovers a supergiant gas field in the Egyptian offshore, the largest ever found in the Mediterranean Sea,’ Eni.com. Available at https://www.eni.com/en_IT/media/2015/08/eni-discovers-a-supergiant-gas-field-in-the-egyptian-offshore-thelargest-ever-found-in-the-mediterranean-sea, accessed 6 October 2018. ERPIC, (2011, September 3) ‘Turkey Threatens Cyprus over Offshore Drilling,’ Energy Brief. ERPIC. Available at https://erpic.org/wp-content/uploads/2017/02/2011-09-03-turkeythreatens-cyprus-over-offshore-drilling.pdf, accessed 25 September 2018. Evripidou, S., (2013, December 13) ‘Cyprus and Egypt sign unitisation deal on the joint exploitation,’ Cyprus Mail. Available at https://cyprus-mail.com/2013/12/13/cyprus-andegypt-sign-unitisation-deal-on-the-joint-exploitation/, accessed 24 December 2018. Freedman, L. (1989) ‘General Deterrence and the Balance of Power,’ Review of International Studies, Vol. 15, No. 2, Special Issue on the Balance of Power: 199-210. George, A. (1991) Forceful Persuasion: Coercive Diplomacy as an Alternative to War. Washington, D.C.: United States Institute of Peace. Hazou, E. (2016, June 27) ‘Drilling for Cyprus gas, a timeline,’ Cyprus Mail. Available at https://cyprus-mail.com/2016/06/27/special-report-drilling-cyprus-gas-timeline/, accessed 5 October 2018. Huntington, S. P. (Winter 1983-1984) ‘Conventional Deterrence and Conventional Retaliation in Europe,’ International Security, Vol. 8, No. 3: 32-56. Jervis, R., (2013) ‘Getting to Yes With Iran: The Challenges of Coercive Diplomacy,’ Foreign Affairs, Vol. 92, No. 1, pp. 105-115. Jervis, R., (Winter 1982-1983) ‘Deterrence and Perception,’ International Security, Vol. 7, No. 3; 3-30. Kambas, M., (2018, February 11) ‘Standoff in high seas as Cyprus says Turkey blocks gas drill ship,’ Reuters. Available at https://www.reuters.com/article/us-cyprus-natgas-turkey-ship/standoff-in-high-seas-as-cyprus-says-turkey-blocks-gas-drill-ship-idUSKBN1FV0X5, accessed 7 October 2018. Kaufmann, W. W. (1954) ‘The Requirements of Deterrence,’ Center of International Studies, Princeton University. Koliopoulos, C. (2008) Strategic Thought [Η Στρατηγική Σκέψη: Από την Αρχαιότητα ως Σήμερα]. Athens: Piotita. Kontos, M. and Karyos, A., (2018) ‘The Threat of Use of Military Force Under Unequal Power Relations: The Crisis of the S300 Missile System in Cyprus, 1996-1998,’ [Απειλή Χρήσης Βίας σε Συνθήκες Ανισοζυγίου Ισχύος: Η Περίπτωση των Πυραύλων S-300, 1996-1998] Political History of the Republic of Cyprus after 1974, organized by the University of Nicosia, School of Law, 12-13 October 2018. Kutlu, O., (2017, March 9) ‘Turkey to seismic explore in Med., Black Sea,’ Anadolu Agency. Available at https://www.aa.com.tr/en/economy/turkey-to-seismic-explore-in-medblack-sea-minister/767151, accessed 5 October 2018. Mearsheimer, J. J. (2001) The Tragedy of Great Power Politics. New York: W. W. Norton. Mekel, A., (2016, January 31) ‘Birth of a Geopolitical Bloc: The Israel-Greece-Cyprus Axis,’ Haaretz,. Available at https://www.haaretz.com/israel-news/.premium-birth-of-ageopolitical-bloc-the-israel-greece-cyprus-axis-1.5397833, accessed 4 October 2018. Peixe, J. (2011, September 25) ‘Turkey Signs Oil Agreement with Turkish Republic of North Cyprus,’ Oil Price. Available at https://oilprice.com/Latest-Energy-News/World-News/Turkey-Signs-Oil-Agreement-With-Turkish-Republic-Of-North-Cyprus.html, accessed 4 October 2018. Phileleftheros, (1998, February 9) ‘Direct agreement with the USA on flights,’ [Απ’ ευθείας με τις ΗΠΑ συμφωνία για Πτήσεις], Phileleftheros. Phileleftheros, (1998, June 10) ‘The S-300 will be ready for deployment in October,’ [Επιχειρησιακά έτοιμοι τον Οκτώβριο οι S-300], Phileleftheros. Prakas, N., (2016, August 2) ‘Turkey warns companies not to explore in Cyprus’ Block 6,’ Sigmalive. Available at http://www.sigmalive.com/en/news/energy/147518/turkeywarns-companies-not-to-explore-in-cyprus-block-6, accessed 6 October 2018. Psyllides, G., (2018, September 1) ‘Cavusoglu: Greek Cypriots act as if Cyprus belongs to them,’ Cyprus Mail. Available at http://cyprus-mail.com/2018/09/01/cavusoglu-greekcypriots-act-as-if-cyprus-belongs-to-them/, accessed 1 September 2018. Psyllides, G., (2018, September 19) ‘Cyprus, Egypt sign gas pipeline agreement,’ Cyprus Mail. Available at https://cyprus-mail.com/2018/09/19/cyprus-egypt-sign-gas-pipelineagreement/, accessed 25 October 2018. Richert, J., (2015) ‘Is Turkey’s Energy Leadership Over Before it Began?’, Istanbul: Sabancı University Istanbul Policy Center/ Stiftung Mercator Initiative. Samir, A., (2017, November 21) ‘Egypt, Greece, Cyprus: Model for successful international cooperation,’ Egypt Today. Available at http://www.egypttoday.com/Article/2/33551/Egypt-Greece-Cyprus-Model-for-successful-international-cooperation, accessed 7 October 2018. Snyder, G. (1960, June) ‘Deterrence and Power,’ The Journal of Conflict Resolution, Vol. 4, No. 2: 163-178. Taylor, C., (1998, January 21) ‘West frets over crisis countdown in Cyprus,’ Cyprus Mail. cypriot-natural-gas-drilling-1.376835, accessed 27 September 2018. Tsakiris, T., (2017) ‘Cyprus’s Natural Gas Strategy: Geopolitical and Economic Preconditions,’ Mediterranean Quarterly, Vol. 28, No. 1: 29-57. Tzionis, T., (2017, January 10) ‘The “defunct Republic of Cyprus” (according to Turkey) in the present phase of the Cyprus Problem,’ Eastern Mediterranean Policy Note No. 13. Nicosia: The Cyprus Center for European and International Affairs. Available at http://www.emgr.unic.ac.cy/wp-content/uploads/EMPN_13.pdf, accessed on 8 November 2018. Waltz, K., (1967) ‘International Structure, National Force, and the Balance of World Power,’ Journal of International Affairs, Vol. 21, No. 2: 215-231. Windrow, G., (2014) ‘Realization of Turkey’s Energy Aspirations Pipe Dreams or Real Projects?’ Turkey Project Policy Paper, Number 4. Washington D. C.: Brookings Institute. Womack, B., (2016) Asymmetry and International Relationships. New York: Cambridge University Press. Xuequan, M., (2018) ‘Turkey starts first deep drilling in Mediterranean Sea,’ Xinhua News, 30 October 2018. Available at http://www.xinhuanet.com/english/2018-10/31/c_137570181.htm, accessed 23 November 2018.